When I first saw a picture of this car I thought it was just some fun and the middle wheel had just been stood there for effect. 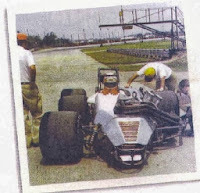 But when I really started looking at it in detail it became clearer and clearer that this racer did actually have three wheels mounted on one side and as such needed much more investigation. In 1979 Kenny Reece, one of the top Supermodfied and Sprint Car builders through the 1970’s, built this specifically for the short sprint oval racing. At the time the rules were pretty relaxed, apart from the usual safety regulations, the rest was up to the builder. Most though went done the traditional route of a wheel in each corner as you would. 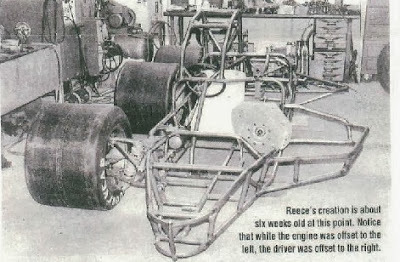 Kenny though started thinking outside of the box, taking in to account years of experience in racing realised that tyre wear could be reduced and better traction obtained by putting the drive wheels at the centre of gravity of the car and removing the front left wheel, he thought he was on to a winner. The rules though required the car to have four wheels, not three. So Kenny just added it out back and also made it a steering wheel as well, so nothing overly complicated there!!!! 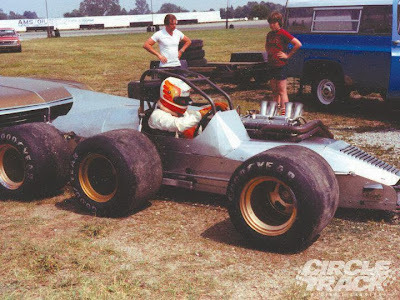 The engine, a full race spec CAN AM with fuel injection that ran on alcohol produced 850bhp and was off set in the chassis to help with cornering on the ovals. 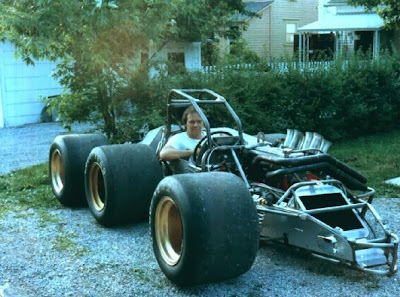 With most of the car constructed out of aluminum including the chassis this was looking at being a very quick car. 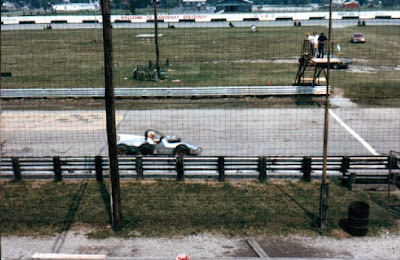 Its first outing at Sandusky Speedway in Ohio piloted by NASCAR driver Tim Richmond it broke the lap record before it was fully dialed in!!!! From there it was taken to Goodyear’s test oval to see what it could really do, well as it turns out over 200mph. To put it to perspective that’s far, far faster than anything it may come up against on the track by a long way. The concern by the rule makers, Oswego, meant they re-wrote the rules now requiring cars to run with two wheels on each side, this simply made the car illegal to drive in competition anywhere. As a result the car never raced, not only that it wasn’t even painted and due to it being obsolete was eventually cut up and incorporated into other “legal” cars by its creator. What a car and what a story, the above is only the tip of the iceberg the links below go in to much more detail. It’s just a shame with all the restrictions now in motorsport as well as the money, no builder will ever produce anything this extreme. The only thing recently that comes close of the Le Mans Delta. too bad we can't have a race entity that has no rules, just bring us the best and the fastest and the rest of you stay home. 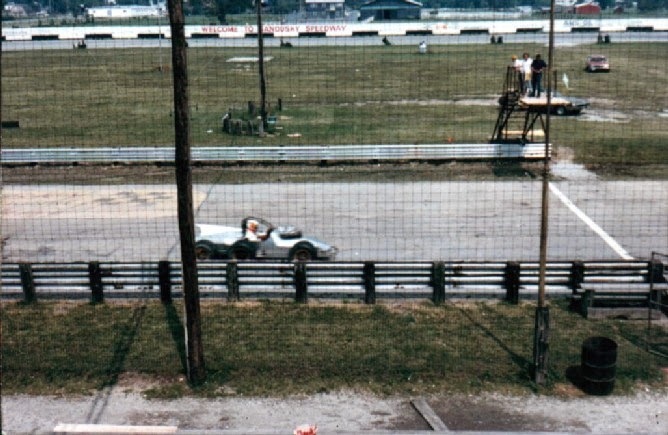 if the rule makers of today were around when auto racing began we might never had developed the rear view mirror or seat belts, or even disc brakes. This blog is wonderful. There are always all of the suitable facts at the ideas. Thank you and keep up the beneficial work like BMW Export UK.